How to Write a Perfect Term Paper in One Evening? Home > Blog > How to Write a Perfect Term Paper in One Evening? Many students find it extremely hard to cope with the academic load, keep track of every assignment they have to submit, as well as all the things that contribute to your college experience (hence extracurriculars and parties). So quite often they fail to submit some papers on time or find themselves with papers due the next day. So let us help you plan your time and write a perfect paper in just one night along with some term paper format advice! You may need to set the times for each section in order to follow the suggested schedule. There is one simple problem with college term papers: you stress too much about them. No, you are at the place where you need to take the motto "better done than perfect" and live up to it. So, sit down, take a couple of deep breaths, and calm down. Then have a look at your topic. Take your time and let it sink making sure you understand the expectations for the assignment, review the term paper guidelines, and begin your work. This part should take you approximately 15 minutes. You can't really work on your term paper structure unless you come up with a thesis you like. The wording might not be perfect, but you need to capture the idea and let it sit for some time. As this is the most important part of your paper, take your time and come up with something worthy. Very often, students wonder how to start a term paper so it is not boring yet complies with academic standards. You need to come up with a strong introduction that begins with a catchy hook sentence and makes the reader stay till the end. You need to bring the topic of your research paper making sure it is both clear and logical. This is not supposed to take you longer than 15 minutes. For the next half an hour, think over all sort of reasons, facts, and ideas that support your thesis and create a list of convincing facts that support the idea behind your thesis statement. Write down the key arguments and make sure to cross out everything that seems far from realistic or academic. Usually, students are given a number of references to be used in their term paper, so for the next 2 hours you have to find the most appropriate scholarly sources to include into your term paper and march them to the list of ideas you have on your brainstorm section. Wondering how to write a term paper? Now is high time to start writing and address every single argument from your list. Draft a plan, include introduction and summary, and keep writing. Remember the rule "better done, than…" and don't let yourself get stuck on the sentence structures, perfect wording, or other less meaningful parts of the process. You will be able to work on this later on. Give yourself at least 4 to 5 hour for the writing itself. We are not asking you to think less of yourself, rather find the weakest arguments and logical fallacies in the structure of your term paper. This time is for you to find any inconsistencies and parts of the paper your professor might not be a fan of. You have approximately 1 hour to do this. Once everything feels good, you may write a summary to bring a logical conclusion. Check if your facts match the thesis statement and reword it in your summary. You need to leave the reader with something to think on. You will have approximately 30 minutes for that before moving to the format of a term paper, so keep on! The term paper format is similar to many other academic writings, so you probably won't have any troubles with it. Read the paper carefully, as it is also your editing time. Use action verbs, active voice and eliminate anything that seems weak. This is the final hour of your work, and it will probably find you in the morning. Pour yourself some coffee, check your paper once more and submit it. We know that this guide to writing term papers is not perfect, but at least it will help you divide your time and survive that night. Sometimes it's all you need. 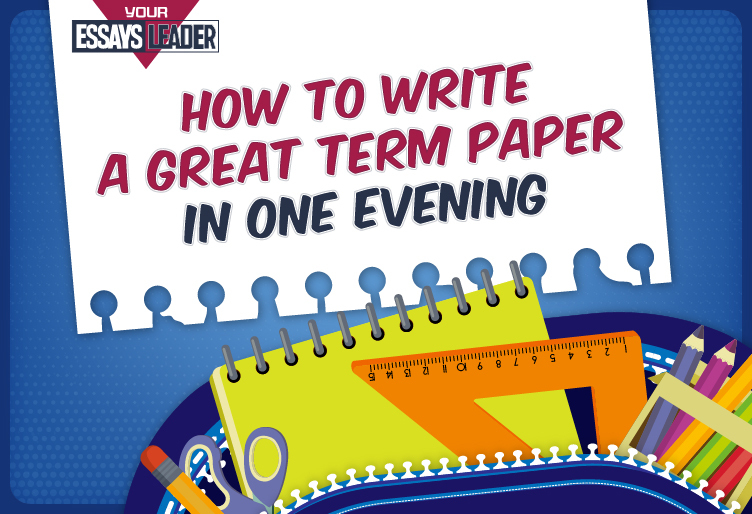 Or there is another simple way to have your term paper prepared in just one night. Refer to professional assistance of EssaysLeader.com and have your paper written in no time! Completely safe and confidential writing service that offers high quality at a low price.